1 of 3 Heat oil in a large nonstick skillet over medium-high heat. Add onion and green pepper to pan and cook, stirring often, for 7 minutes or until softened. 2 of 3 Sprinkle beef with salt and pepper. Add beef to pan and cook 3 minutes, stirring occasionally, or until cooked through. Stir in Worcestershire sauce; cook 1 minute. 3 of 3 Heat broiler. 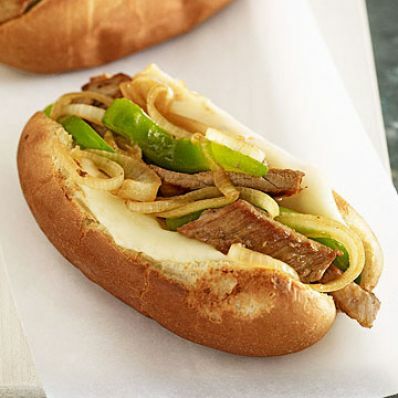 Tuck 1 slice provolone into rolls and top with a scant 1/2 cup beef mixture. Arrange rolls on a baking sheet and put under broiler for 1 minute or until cheese has melted.